Adult Diagnosis: As the only species in the genus Plectrodera these beetles are easily identified. The adults are black with patches and cross stripes of white setosity and black antennae. The pronotum has a large spine on each dorso-lateral side. Females tend to be larger in size (up to 40 mm) than males, but the males have longer antennae than the females. 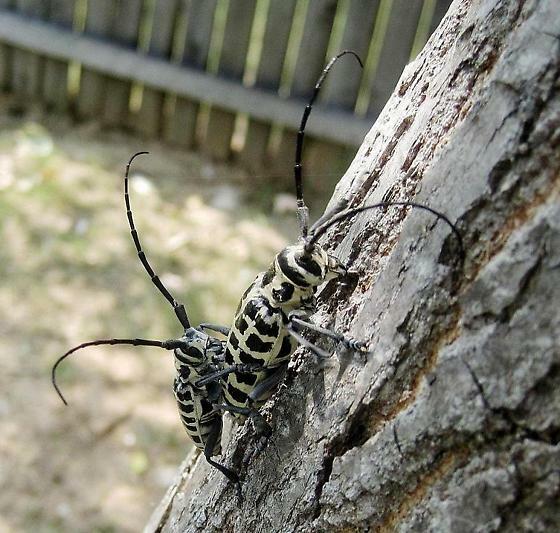 The all black antennae distinguish this species from the similar looking Asian Longhorned Beetle (Anoplophora glabripennis), which has black and white striped antennae. Adult Natural History: The adult cottonwood borer is usually active during June to August and feeds on cottonwoods, willows, and poplars, especially Populus deltoides. They use their chewing mouthparts to feed on new twigs or leaf stems. Adults can cause serious damage especially in cottonwood and willow nurseries. Females will deposit eggs into small pits at the bases of the host tree. Distribution: Distribution of this species is throughout the eastern United States West of the Rocky Mountains. Habitat: Both adult and larvae usually occur on cottonwood, poplar, and willow trees. Diet: The larval diet consists of the phloem of trees mostly from the root collar and below. The adult beetles tend to feed on new shoots of cottonwood, poplar, and willow trees. Goldsmith, K.S, Z. Stewart, S. Adams, and A. Trimble. 1996. Body size, male aggression, and male mating success in the cottonwood borer, Pectrodera scalator. Journal of Insect Behavior 9(5): 719-727. Lingafelter, S. W. 2007. Illustrated key to the longhorned woodboring beetles of the Eastern United States. Coleopterists Society, North Potomac, MD. Linsley, E. G. and J. A. Chemsak. 1984. Cerambycidae of North America. Part VII, No. 1: Taxonomy and classification of the subfamily Lamiinae, tribes Parmenini through Acanthoderini, Volume 114. University of California Press, Berkeley, CA. Yanega, D. 1996. Field Guide to Northeastern Longhorned Beetles (Coleoptera: Cerambycidae). Illinois Natural History Survey, Champaign, IL.